When coming to the Alps: Chamonix, Zermatt, Grindelwald , the best airport to fly into is Geneva. 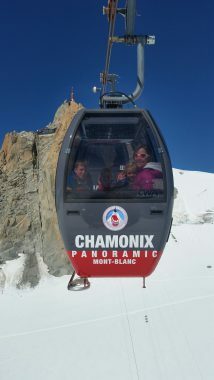 GVA is about one hour from Chamonix and easy to transfer using a shared shuttle service. Some useful links here are: www.mountaindropoffs.com, www.alpybus.com, www.chamexpress.com There are several others you can find using a simple google search. Expect to pay around €30 for a one-way ticket from the airport to Chamonix. an to use the railway system it makes sense to purchase a ½ fare card at the train station or prior to your trip departure. This will give you a -50% reduction on your train fare, Swiss Post Buses and many lifts in the country. There are many options for accommodation in Chamonix, Zermatt, Gridelwald or wherever your trip takes you. A search engine will help in tracking down the best deals during your visit. For small groups or even individuals, airbnb.com can be a good solution. For many of our programs we handle accommodation, but contact us if you have specific questions regarding places to stay. France and Italy both use the Euro while Switzerland uses the Franc Suisse. Changing currency at the airport is a good idea, but there are many places to exchange cash in Chamonix. If your trip will take you into multiple countries (i.e. 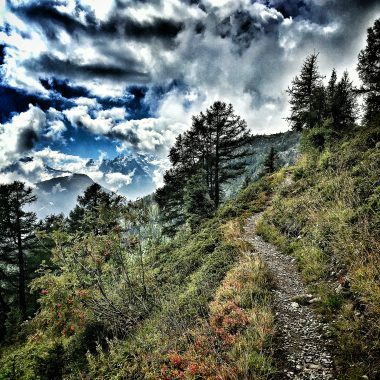 the Haute Route), it is a good idea to have some cash in both Euros and Francs. Credit cards are widely accepted, but not every Hut will take a card and often small restaurants or lifts will only take cash. ATMs are easy to find and probably the most convenient way to get local currency. 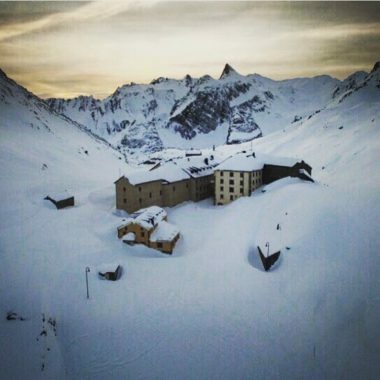 Depending on what type of trip you have signed up for, you will likely be spending a night, or several, at one of the many Alpine huts. These huts can vary widely, but most offer basic accommodation reasonable meals and beat camping! Huts will provide blankets, slippers and require that you use some type of sleep sac to keep the linens clean. Breakfast and Dinner will be provided at the hut and it is possible to purchase packed lunches, snack food and a wide array of drinks (including alcohol). Many high mountain huts will NOT have running water or provide drinking water, so make sure to budget for this (bottled water averages at 8€ for 1.5liters). Huts will cater to special dietary needs (vegetarian, gluten free within reason), but make sure to tell them or us upon arriving at a hut. Lastly, on popular itineraries hut reservations can be difficult to obtain and impossible to change, especially with larger groups, so keep that in mind during your trip. Hut prices vary a bit from country to country, but expect to pay around $100 night plus any extra food and drinks. The lift infrastructure in the Alps is quite simply mind blowing! In fact, riding some of the teleferiques and mountain trains is as much a part of the experience as the climbing itself! The lift systems save time and energy allowing us to climb more and approach less. 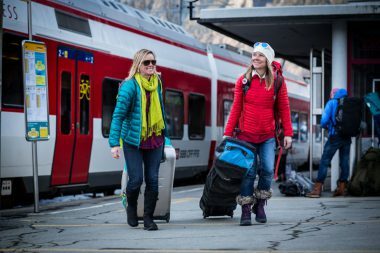 Prices of these lifts can be steep, so depending on what type of trip you are on it may make sense to purchase a Swiss ½ fare card, or a “multi-pass” in Chamonix. The Alps has unquestionably the best mountain rescue resources in the world. Most rescues are done by helicopter, which can access some incredibly technical terrain very efficiently. While we are lucky to have such a safety net on our trips, rescue costs are high. Therefore, we require everyone to have some type of mountain rescue insurance. There are many different policies out there, but we have found a membership with an Alpine club is one of the easiest ways to go. A membership will provide both mountain rescue insurance and discounts at huts. 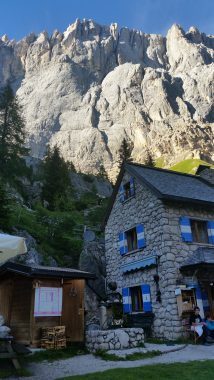 The American Alpine Club and Austrian Alpine Club (UK section http://www.aacuk.org.uk/) are both popular and easy to join. Rescue coverage varies amongst these clubs, so make sure to contact them and be sure they cover European Rescue and find our there policy and rescue protocol specifics. Another option is to get a policy through Global Rescue. Depending on what type of trip you signed up for, all-inclusive or otherwise, you may be responsible for covering “Guide’s expenses,” and certain travel expenses. This may include: lodging, lift tickets, hut fees, gasoline and tolls. Just make sure you are clear on what expenses you will be responsible for on your trip and we would be happy to provide a breakdown for you depending on your itinerary.